After upgrading from Mojave developer beta 2 to developer beta 6, a ton of things broke and stopped working. Even on developer beta 8 (build 18A371a) this issue persists. One of these things is the function keys, but only after a while. I tend to leave my MacBook Pro on overnight, and after that, the function keys stop working. I've tried killing SystemUIServer and letting it restart, but that doesn't seem to work. The only solution I've found is to reboot the computer. I'd like to be able to turn my keyboard backlight back on after closing the lid. I'd like to be able to adjust the volume without going to System Preferences. Is there a way to fix my function keys without a reboot? Rebooting can be extremely cumbersome at times and a huge inconvenience. My build number is 18A371a. When these keys stop working, some other things stop working as well, such as About This Mac, the sleep/restart/shutdown controls, the Messages app, as well as some other things. It really seems like some critical process is crashing, but I don't know what to restart. The Radar number is 4873261. It seems like loginwindow likes to crash sometimes on Mojave, so this may be your issue. Also, if you are running any code injector, make that the first thing you shut off. It seems obvious, but it's happened. I would try just logging out to see if that restores the process that handles function keys. Be sure to run sysdiagnose right after you restart and then once when you find the keys not responding, since Apple would surely then be able to fix whatever process is crashing if you can document it during the beta process with evidence captured in the system diagnosis. The log out process can signal to apps to clean up and is much faster than a restart of the whole OS (which also calls the log out process first). If you're looking to track this down, try to determine if the failing process is user level or system level. Knowing that will help you with the quickest fix and help apple fix this in code for a next build. Not the answer you're looking for? 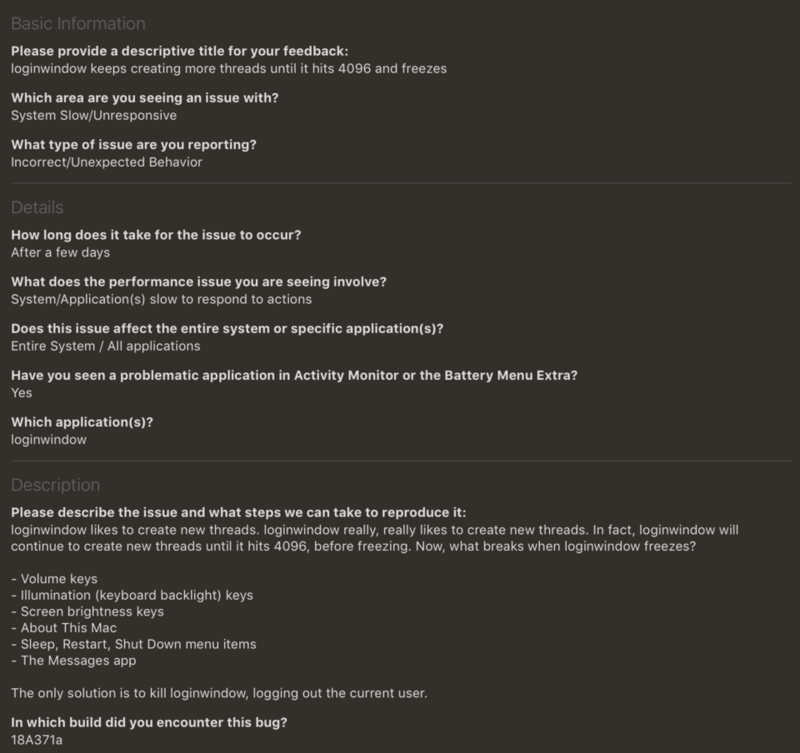 Browse other questions tagged beta-seed-program mojave keyboard .